Your child telling you that he or she wants to be a vegetarian can sometimes be daunting to hear. For many children, discovering where meat comes from can drive them away from eating it. It is not uncommon for a child to have a strong love for animals, so never try and force them to eat meat. Instead, you should always support your child and understand that it is entirely possible to eat a vegetarian diet while maintaining the same level of health and happiness. Often times children are experimenting with their lives and trying to decide who they are and who they want to be. This is completely normal, and your child wanting to be vegetarian may be a result of this. You shouldn’t rely on it being a temporary thing, but often times it is and your child will eventually want to eat meat again. Act as though it's a permanent change and provide interesting vegetarian meals - even carnivores should eat plenty of veg so use this time as an opportunity to experiment with ingredients, and telling kids 'it's just a phase' will only irritate them. You don’t have to adjust your diet or eating habits if your child wants to be a vegetarian. They will likely understand that you still want to eat meat and shouldn’t be offended if you eat meat in front of them. However, it is important to ensure that they have alternatives at the dinner table. Some common alternatives for meat include portobello mushrooms, eggplants, and vegetable based meat replacement products offered by many big brands in supermarkets. Tofu is a staple of the vegetarian diet, and when prepared inside a good Tex-mex or similarly tasty dish there will be zero complaints about it being bland! 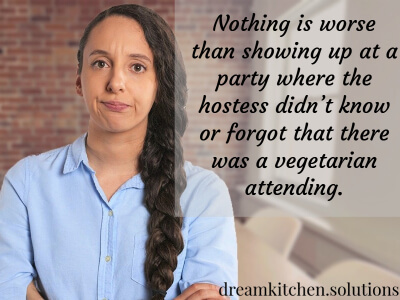 Nothing is worse than showing up at a party where the hostess didn’t know or forgot that there was a vegetarian attending. To avoid this situation, always be sure that family and friends know about your child’s diet change, and be sure to remind them before any get together (people can, and do, forget!). Anybody can be a vegetarian by just eating potato chips day in and day out… To avoid this, you need to ensure that your child has healthy meat alternatives and plenty of fruits, vegetable, and nuts to munch on. If you are ever concerned for any reason about your child’s eating habits, it is a good idea to see a nutritionist who would love to help you perfect their diet. Protein is probably the most important part of your child’s diet that you should watch. 20 percent of the human body is made up of proteins. Some common alternatives include mushrooms, nuts, and tofu. Iron increases energy levels and helps distribute oxygen throughout the body. Some common sources include quinoa, beans, and oatmeal. This one isn’t as problematic with a vegetarian diet, but it is of course still important to feed your child lots of calcium-rich foods. Almond milk is a great source of calcium and can offer twice the amount of calcium as real milk does. Finding new vegetarian recipes for your family to try will make your child feel accepted, supported, and cared for. While you don’t need to have a vegetarian dinner every night, it will make your child’s little heart happy to know that his or her parents are going the extra mile to make them happy. As a general rule, the more naturally occurring colours on your plate, the healthier and better balanced your diet - here's a whole spectrum of ideas! Feeling hungry? Here’s one simple recipe for authentic Soto Kudus, a variation that originated in Central Java.